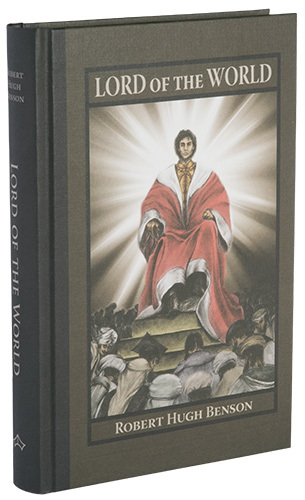 Baronius Press: Lord of the World by Robert Hugh Benson. Lord of the World describes "a � unified civilization and its power to destroy the spirit. The anti-Christ is represented as the great carrier of peace in a � new world order." This edition has been re-typeset using the text of the 1907 edition originally published by Sir Isaac Pitman & Sons, London. Lord of the World was described by no less an authority than Fulton Sheen as one of the three greatest depictions of the advent of the demonic in modern literature � the others being The Brothers Karamazov and Solovyov�s Three Coversations. In some respects Lord of the World represents a departure for Benson, whose religious novels are almost evenly divided between historical and contemporary studies: Lord of the World is a futuristic fantasy�but it is science fiction with a twist, for it is about the coming of Antichrist. The genesis of the novel is of some interest. Benson had befriended the fascinating and rather macabre Frederick Rolfe (also known as Baron Corvo), and the two men had worked together on some literary projects, including a life of St. Thomas a Becket. Rolfe had recently published what was to become his most famous novel, Hadrian the Seventh�an extraordinary book about an Englishman who becomes pope and is assassinated by the socialists. Rolfe�s magnum opus fascinated Benson, and clearly influenced the writing of Lord of the World. The novel is set in the twenty-first century, mostly in England. The West has succumbed to a sort of international socialism. The forces of secular materialism, relativism and state control are everywhere triumphant. Protestantism is no more, and Catholicism�which had made some major advances in the first half of the twentieth century � has been devastated by the development of new psychologies and the exodus of intellectuals in the wake of an Ecumenical Council. Euthanasia has become an instrument of the state, Esperanto the universal second language. Nevertheless, although organised religion has largely collapsed in the face of institutional secularism, a vague, humanistic religiosity�militantly hostile to the exclusive and supernatural claims of the Church�is everywhere present. Finally, the East, which has amalgamated into a single, pantheistic bloc, continues to pose a military threat. Enter Julian Felsenberg�diplomat, scholar, guru, Antichrist. Felsenberg uses his uncanny gifts to bring peace to the world, which, in its gratitude, acclaims him messiah of a new religion in which man realizes his own divinity and worships himself. Only Rome, with its dwindling adherents, stands firm. though Huxley�s and Orwell�s modern masterpieces may merit equal praise as works of literature, they are clearly inferior as works of prophecy. The political dictatorships that gave Orwell�s novel-nightmare an ominous potency have had their day. Today, his cautionary fable serves merely as a timely reminder of what has been and what may be again if the warnings of history are not heeded. Benson�s novel-nightmare, on the other hand, is coming true before our very eyes. Lord of the World is much more than a cautionary tale or scientific romance, however. Indeed, it is more than a prophecy, for Benson was not absolutely convinced that, when the end came, it would come like this: he even wrote a novel�The Dawn of All�about an alternative, positive, development set in roughly the same period. Above all, it is a study of how the end might come; and, as such, it derives its power�and even its power of prophesy�from Benson�s profound understanding of two things. In the first place, like Chesterton and Solovyov, Benson understood the spiritual condition of our society as it entered the twentieth century. This enabled all three of them to make predictions of startling accuracy of events they did not live to see. In the second place, he understood the heart of man. We do not know when�and, therefore, precisely how�the end will come. Such was the teaching of Our Lord. When it does come, however, it will probably bear some resemblance to Benson�s tale, because the essential elements�God, Satan, and fallen Man�are the same now as when he wrote Lord of the World in 1907. I am perfectly aware that this is a terribly sensational book, and open to innumerable criticisms on that account, as well as on many others. But I did not know how else to express the principles I desired (and which I passionately believe to be true) except by producing their lines to a sensational point. I have tried, however, not to scream unduly loud, and to retain, so far as possible, reverence and consideration for the opinions of other people. Whether I have succeeded in that attempt is quite another matter.